We’re here to talk about Twin Peaks, the now-classic David Lynch/Mark Frost-created television series, but before we do, take a second to put it into context by looking at the TV landscape in which it debuted in the spring of 1990. It isn’t a wasteland, exactly. Next to classic sitcoms like Cheers and Roseanne, you’ll see some shows beginning to push the boundaries of what TV can do. The past few seasons saw hybrids like Moonlighting and stylish breakout hits like Miami Vice thrive, however briefly. “Dramedies” like the sadly forgotten Frank’s Place (someone put that out on DVD, please) made an impact with critics, though not viewers. But overwhelmingly, it’s a bunch of shows that adhere to the tried-and-true formulas of traditional sitcoms, cop shows, and a few remaining nighttime soaps. Send in the dancing dwarf. It’s probably nothing but coincidence that 1990 saw the debut of The Simpsons (I’m not counting the Tracey Ullman Show shorts or the Christmas special, because that would screw up my theory) and Twin Peaks, but it’s no coincidence that the following decade saw television growing smarter and more cinematic. Those of us who write about TV for The A.V. Club write about both shows a lot. But I think it’s for the same reason those of us who write about music end up talking about, say, Talking Heads a lot. Some things just change everything. 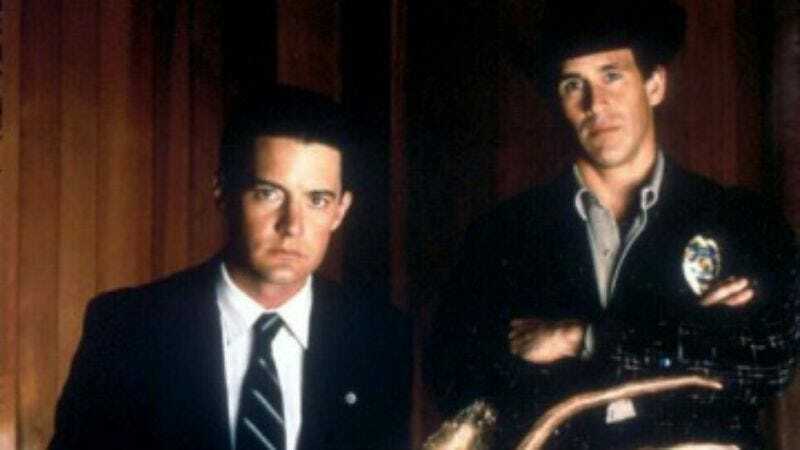 Twin Peaks certainly did that in the spring of 1990, when it became a runaway hit. Then its popularity faded at an alarming rate, and by the spring of 1991, it was finished. Its immediate influence was a lot of self-consciously quirky shows, some of them quite charming (like Northern Exposure). Its lasting legacy was a television landscape that would never again look like it looked in 1989. Its weird mix of high drama, eccentric comedy, and borderline camp didn’t break the rules so much as point out that the rules were all just an illusion anyway. So let’s have another look. Each week, this space will revisit two Twin Peaks episodes, from the double-length pilot (which I’m counting as one) through the end, with some digressions here and there. I’ll be your host, so let me take a second to set up my Twin Peaks bona fides. Twin Peaks debuted during my junior year of high school, and I watched religiously from the beginning. I’d had only a little exposure to David Lynch’s work up until that point. I vaguely remember watching The Elephant Man on television, and I vividly remember walking out of Dune as a kid, when it played at the dollar theater near my house. (I think I was expecting something more along the lines of Tron. I can’t say I’ve fully come around on that movie in the years since, but I definitely like it more now.) But I’d read the reviews of Blue Velvet, and soon after Peaks’ debut, I found a copy of that movie on VHS (in, ack, pan-and-scan), watched it, and shared it with some friends who were a little more dubious. (When I later dragged some to a screening of the early Lynch short films “The Grandmother” and “The Alphabet” at a nearby college, I almost lost them for good.) Something about the worldview of Blue Velvet and Twin Peaks struck a chord with my teenage brain. Growing up in a suburb of Dayton, Ohio, there weren’t a lot of things telling me that maybe everything wasn’t all right, that maybe all those close-cropped lawns hid a dark side. Maybe everyone around me hid a dark side. And maybe there were other ways of looking at the ordinary. Lynch wasn’t shy about pointing this out. And he wasn’t shy about putting it in the boldest terms possible. (I don’t want to slip into the habit of referring to Twin Peaks purely as Lynch’s creation, since the credit deserves to be spread around, but indulge it here, if you will.) In Lynchland, there’s good and evil, though it’s never as easy to tell them apart as we’d like. And while Blue Velvet presented this to appreciative arthouse audiences who probably had already had a taste of the transgressive, Twin Peaks transmitted this into living rooms nationwide every week. I was hooked. 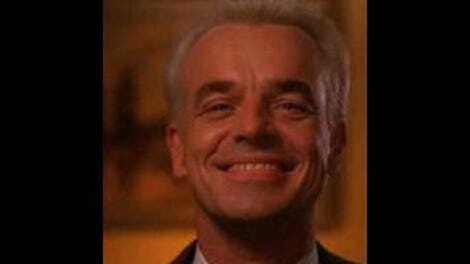 I stuck with Twin Peaks as its popularity faded, and revisited it over the years. More accurately, I revisited the first season quite a bit, both on VHS and on DVD, and it looked a little different each time. (I liked the second season quite a bit at the time, but never got around to watching it a second time through, until now.) But I’m by no means a superfan. There’s much I don’t remember. I’m not conversant with all the fan theories floating around. I never subscribed to Wrapped In Plastic, and I never went to a convention. I’m an enthusiast, not an expert, as I’m sure any superfans reading this will find out by the end of this post, and in future posts. But I’m getting ahead of myself. Let’s start at the beginning. After meeting the immediate family and law enforcement, the pilot expands to meet Laura’s other friends and acquaintances. From there, I could go on and on, but I’m just going to assume you’ve watched it too, and we can delve deeper into each character as we deal with future episodes. So let’s take a brief moment to appreciate two things: 1) The magnificent hair atop the head of Laura’s aggressive boyfriend Bobby Briggs (Dana Ashbrook), a hairstyle one never-to-be-named A.V. Club staffer tried unsuccessfully to re-create for a while in the late ‘90s. And 2) our protagonist, Special Agent Dale Cooper (Kyle MacLachlan). Cooper is the quintessential Lynch hero, an all-American kid who’s never lost his gee-whiz wonder at pie, Douglas firs, and great coffee. He’s also become familiar with the dark side of life and found a way to deal with it. For Cooper, this skill comes from a grab bag of Eastern wisdom. (Lynch, meanwhile, is a longtime advocate of transcendental meditation.) Sometimes it feels as if his Blue Velvet character recovered from the whole experience by taking a year off, studying philosophy, then joining the FBI. Another actor might have overplayed the part, but I love MacLachlan’s performance here. He’s gleefully enthusiastic about his new surroundings, yet professional to the last. His tapes to the never-to-be-seen “Diane” could have just been a lazy way to get a lot of exposition out of the way, but they’re used here, and in later episodes, partly as a summing-up device, and partly as windows to Cooper’s soul, a place where sunny thoughts always triumph over doubt, though it’s sometimes a fight to the finish. (I occasionally wondered if maybe there was no “Diane” at all.) He’d be interesting even if the show wasn’t. There’s also a great eccentric-but-brilliant-Holmes/levelheaded-Watson dynamic to Cooper and Truman established in the first scene, a dynamic that keeps the show grounded even when it wants to come unmoored. I’ve gone on a bit, and though there’s much more to cover (and I will in future posts), let’s talk about endings. In the final sequence, the tone shifts yet again. We’ve had raw drama, police procedural business, comic character development, and soap-opera entanglements, but now, we’re into the realm of the unsettling. In other words, we’re on Lynch’s home turf. In one of the making-of pieces included in the Gold Box set, Frost talks about selling the concept in a presentation that partially included Lynch talking about how the wind moves eerily through the trees, and gesturing with his hands to indicate what he meant. It’s here, at the end the pilot, that we really see what he meant. Pursuing James (James Marshall) and Donna (Lara Flynn Boyle) at night, Cooper and Truman enter a world never meant to be illuminated by headlights. Lost in the woods are the two soon-to-be-lovers, acting out a desperate scene. It was filmed, at Lynch’s insistence, in the middle of the night in the freezing cold, even though it’s played mostly in close-up. It probably pained the actors to make it, but neither Boyle nor Hurley have ever played a scene this well. United by loss, their characters pledge their love in the middle of all that darkness, and we get a hint of what–beyond the mystery of who killed Laura Palmer, the beautiful girl undone by the corruption of the town that made her homecoming queen–the show is really about. Endings again: Frost and Lynch shot another 20 minutes winding it all up for foreign markets who wanted a standalone product. (And presumably for ABC, who probably wanted a TV movie to air if they didn’t pick up the expensive pilot.) Included in this DVD set, it’s a pretty lousy finale, if only because it breaks a cardinal rule of the mystery genre by introducing a killer we’ve never seen before. But in it lie the roots of the Bob/Mike characters and the whole backwoods mythology that would be so important for the show in episodes to come. Lynch also recycled the weird coda as the dream sequence in the series’ second episode. The first shot of a human face is of Joan Chen putting on makeup. Fitting for a show about concealment and multiple personas. Let’s take a moment to salute some characters we won’t be seeing much of again: Donna’s poetry-writing, frizzy-haired sister Harriet (Jessica Wallenfels), Principal Wolchezk (the well-employed Troy Evans), and Heidi, the giggling, zaftig German waitress (Andrea Hays).